The Icelandic Saga. Not until the thirteenth century did the fictional prose narrative emerge as a full-fledged genre in Western Europe. The smattering of prose romances on the European continent was soon overshadowed by an astonishing outburst of creativity from Iceland. This sparsely settled land near the Western civilization's western boundary had been colonized by men and women from Norway at the height of the Viking Age. 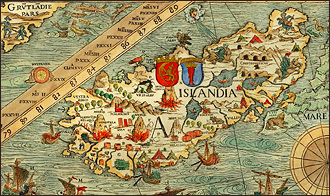 In the early 1200s, Iceland entered its final few decades of independence and produced a new genre: the Icelandic Saga. Gleaning a rich storehouse of family traditions and skaldic poetry, writers began to produce substantial prose tales, retelling old legends and tales about the island’s settlement and its many family feuds, as well as stories of the early Norse kings. The direct, matter-of-fact style of Icelandic saga made it easy for later generations to take at face value their claim to be history; when studied with a skeptical eye it became clear that these works were something arguably more important: the first significant body of non-poetic historical fiction. 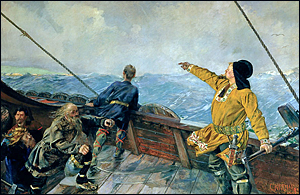 The favorite subject of the saga authors was the Viking Age, the great era in which Scandinavian raiders and traders poured across the waterways of the Western world and irrevocably changed history. For all intents and purposes, the sagas about the Viking Age mark the birth of the historical novel. Telling stories about men and women who had died more than two centuries earlier, they used dialogue and blow-by-blow descriptions of their warfare to flesh out the barer record left by poets and oral tradition. These sagas may be the most accessible literary works produced in the Middle Ages. A few technical quirks may prove off-putting, but these are really pretty minor. Yes, the tales can start out a bit dryly, often with a detailed account of the protagonist’s family tree, followed by several paragraphs or pages about a character’s parents. Similar excursions into genealogy may accompany the arrival of a new character. To a modern reader, this placing of people within a skein of family relationships may seem irrelevant, but as one gets used to it the distraction recedes and the connections may even add something. That hurdle crossed, the sagas make easy reading. The style is spare, the storytelling direct, and there’s not a lot of delving into the characters' inner states. We come to understand the people through their actions and words, the former far outweighing the latter. A good overview of the genre, including some of the very best, can be found in the collection The Sagas of Icelanders, edited by Jane Smiley with an informative introduction by Robert Kellogg. Highlights include two items on my list of The 45 Best Historical Novels Set in the Viking Age: Egil’s Saga and The Saga of the People of Laxardal; the two crucial sagas about Vinland, The Saga of the Greenlanders and Eirik the Red’s Saga; and The Saga of Gunlaug Serpent Tongue, a sort of sequel to Egil’s Saga which deals with another troublesome Viking poet, his life complicated by his entanglement with Egil’s beautiful granddaughter. And if you yearn for a story where a man gets bashed twice by one woman and later stabbed by another (he deserves all three assaults), you’ll probably enjoy Gisli Sursson’s Saga. David Maclaine is currently at work on a non-fiction book about some remarkable, little-known medieval women who turn out to be his ancestors. His blog is davidmaclaine.wordpress.com.